My schedule for last Saturday was rather packed. I went to work in the morning - half day on Sat. My family was supposed to meet for lunch to celebrate mum's birthday after work. We only decided on the place that very day. After work, hubby and I rushed to Arab Street to recce for makan places. We settled for an Arab Restaurant called Samar on Kandahar Street. All of us met at the restaurant at about 2.30pm for late lunch. Sneak peak at what my bro and I had. 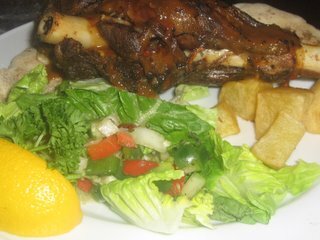 Eldest bro had lamb shank and potatoes. 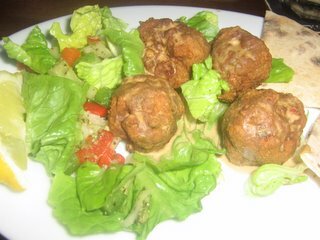 I had Beef Kofta with Arab bread, something rather light. After lunch, the whole party of 10 trooped down to Arab Street to jalan2 and we shopped a little. We dispersed at about 6.00pm and headed home. Next on schedule was to attend a bbq party at East Coast. It was a double birthday celebration for Aliza and Suhailah. This was also a time for me to meet up my cousin Jules and her fiance who had arrived from London the day before. My family left home at 8.10pm for East Coast. Caught up with the birthday gals, cousin, her fiance, sis and frenz. We ate, chatted and took picture. My day did not end there. Next stop was to meet my ........................................ bed .... hehehe Gotcha. My family head straight home after the bbq, washed up and hit the sack. To Aliza and Suhaila - Happy Birthday gals! Jaga diri .. hiasi peribadi!